So: 90 percent of life is just showing up (at the finish line, anyway). 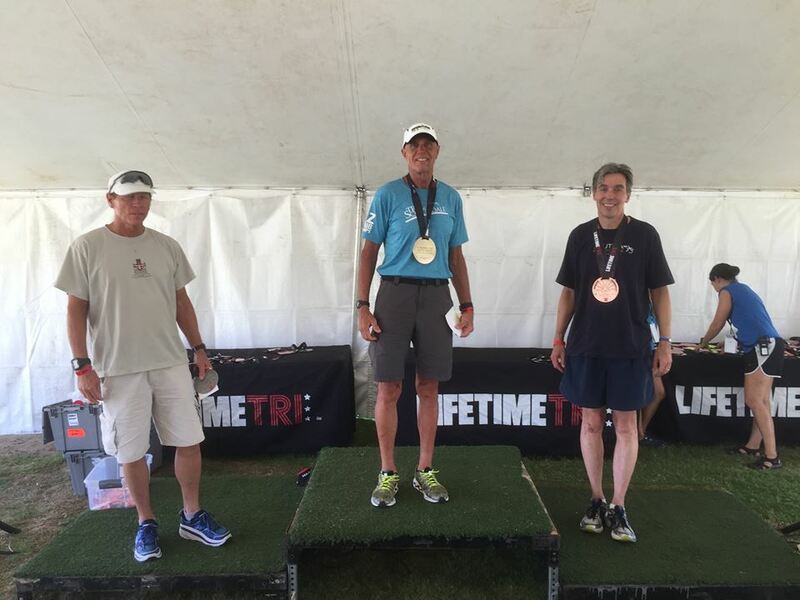 There were only 5 entries in my age group, but I finished third, and got "a podium" and a medal the size of a salad plate. 3:17:15 isn't a very good time, and I've done basically this course in 30 minutes less, but not when it was that warm or when I was more worried about recovery from an injury than my time. So good! This was a test race, to see if my foot would hold up on an Olympic run, and it did. 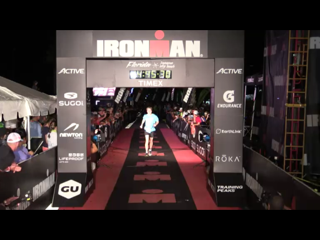 I took transitions very slowly, no running out of the swim or with my bike, and started walking before I felt comfortable enough to run. 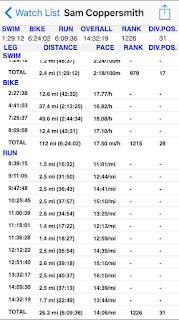 OK swim (34 min; I think that includes walking from the water exit to transition, the swim felt faster than that); good bike (1:22 overall, with a slight negative split, 17.9 mph on the first loop and 18.1 on the second), and a 10K run-walk in 1:13, which is better than I thought it was (with the heat, it felt longer), and with a slight negative split as well. 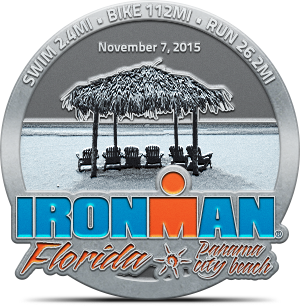 All in all, a very satisfactory day, and a necessary-but-not-sufficient test for IM Florida in not quite 6 weeks. She finished 8th among the pro women; came out of the water 7th, having lost the lead group (the women started 11:37 ahead of the men to allow for a grand prize for the first finisher, either male or female) and basically held that place the entire race; her results are here, and her blog post on her race is here. She's only 24, so I'm hoping she's a rising star and someday these photos are "I knew her when" items. The men's pro race was unusually exciting, with 6 lead changes, which rarely happens, but which we never saw because it was happening out of the bike course; we'll get to see it when the TV show is on (only on SNY, which we don't really get here in Arizona), because the camera-person (who rode on back of a motorcycle on the bike and run course) reported how much fun he had watching the battle. But for NYC, there were very few spectators. 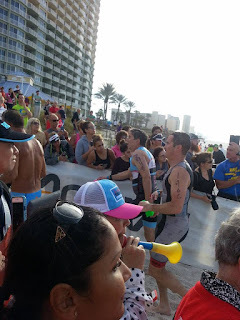 It was a very hot and humid day, and during the race, organizers cut short the run for the last amateurs for safety reasons. I only stayed at the finish for the pros and the first few elite amateurs as the TV crew didn't need me anymore, but when there are more competitors than spectators in New York City, you're clearly a niche sport (especially when compared to the absolutely packed NJ Transit train from Penn Station that afternoon, filled with fans headed to MetLife Stadium to watch Mexico-Costa Rica in the CONCACAF Gold Cup match). 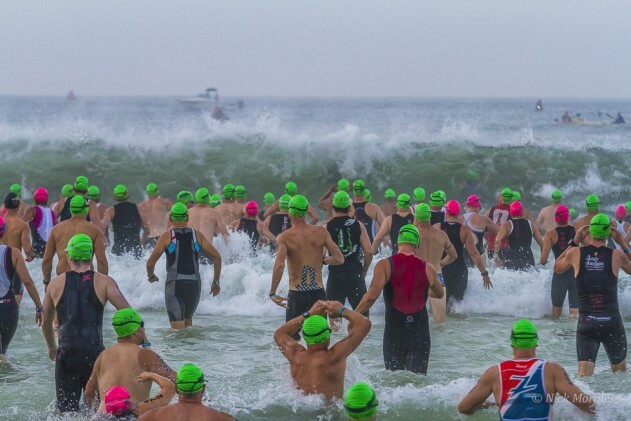 But I now have guaranteed entry for 2016--see you there, where I hope to do better than in 2009 in my two-steps-up age group. Thanks to Vulture. I'd forgotten this. Also much fun, even if you hadn't been to those places while visiting your kid in college. A wonderful day. The weather report a few days out was not so good, but as we got closer to Sunday, it kept improving and was about as good as it gets. The Brews Brothers acquitted themselves very well; almost 30 people finished, and I'm not aware of even one flat tire. 99 miles, 6:06 riding time, approximately 4,900 feet of climbing, about 8 hours total (you don't want to miss the rest stops, and one of our group said that the new red potatoes were as good as I had said). A great day, considering that AMBBR was the first time I was able to get back on my bike since my crash last month. We raised over $61K, making us (well, Andy) the #2 fundraiser nationally. Non semper est rectus, sed nunquam in dubium! 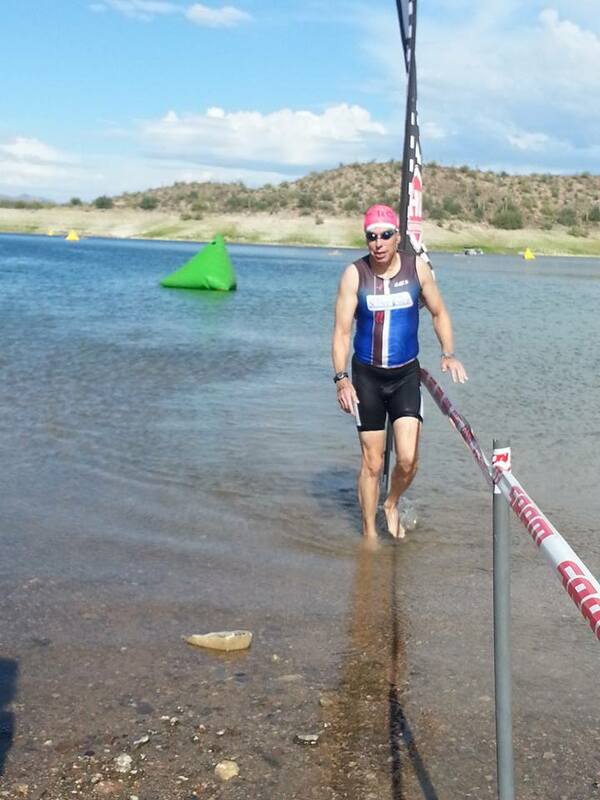 I had a good swim and nice bike, but when I got off the bike, my foot didn't feel right. I decided to walk the first mile and see if my heel would loosen up and stop hurting, but it never completely freed up. Rather than risk injury for no reason, I walked the 3.1 mile loop and didn't do the second loop to risk further damage. My time would have been 3rd in my age group, but I emailed the race director and DQ'd myself this morning. It looks like I need to figure out a different way to do Florida unless something changes footwise over the next few months. 1. It’s a ride, not a race. There are no timing chips, nobody cares (or will be able to find out) how fast you finish, if you finish before the guy with the car keys, you’ll be waiting anyway, and if you don’t stop frequently and enjoy the scenery, you’ll miss a lot of what makes the ride fun. 3. After the checkpoint, you almost immediately enter the switchbacks climbing up to the top of Emerald Bay, but the road up the mountain is filled with multiple riders abreast, with tremendously varying skills. You will not be able to maintain a consistent pace up Emerald Bay, and will have to watch out for slower riders who, despite trying as hard as they can, can’t avoid weaving and can’t stay out of your way. It’s just the way it is; you’ll have to spend 20-30 minutes avoiding other riders while climbing. Don’t gripe about it, or you’ll be the jerk, not them. 4. The summit atop Emerald Bay isn’t a rest stop, but almost everybody stops there anyway to shed layers and use the park restroom facilities. If you have a spouse or friend who wants to be an illegal SAG wagon, that’s a great place to meet them. (The other great place to meet is the Truckee rest stop.) Even if the day is cold at the start, you’ll have warmed up by the top of Emerald and want to shed some clothing. Just don’t drop everything; there’s a significant drop after Emerald summit, and you may wind up going the fastest of the day on the ride back down to the lake, and you may wish you had kept your jacket and/or arm warmers. 5. Don’t miss the Homewood rest area, at mile 25-30; the new red potatoes boiled in salt water are probably my favorite cycling food ever. However, at Homewood – and every other rest area – don’t wait in line for the port-a-potties, where there’s always a line; the line is always shorter for some reason at regular rest room facilities, which at Homewood are the restrooms for the ski area, and at other rest stops, look for the restrooms at the supermarket at Truckee and the public park restrooms just before the lunch stop at Kings Beach. 6. The turnoff for Truckee is at about mile 35. You can make a game-day decision whether to go for the century or limit your ride to 72 miles. It’s a slight downhill to Truckee, but that means a slight climb back to the Tahoe route, and it can be windy. The scenery is nice, you pass the site of the 1960 Winter Olympics, and the route to and from Truckee is a great paceline opportunity. So if you go to Truckee, don’t go alone, or find other riders to work with or it can be a long ride. 7. They serve a regular lunch – sandwiches, chips, cookies, fruit – at Kings Beach, at about mile 65. Make sure you don’t vary your nutrition (in terms of amount) too much, because about 5-10 miles after Kings Beach is the 1,500-foot climb up to Spooner Summit, which is 7,000 feet. It’s not a steep climb but it’s about 15 miles long; if you did Nine Mile Hill, you shouldn’t have any problems. UPDATE: 7A. I forgot to add that after lunch at Kings Beach, you cross into Nevada and shortly after the apex of Crystal Bay, the ride leaves NV-28 to follow Lakeshore Blvd. through in Incline Village. There are a series of 4-way stop signs on Lakeshore, with IV residents in lawn chairs who monitor that cyclists stop at each of them. It's a waste of time and energy but you have to obey traffic laws here or face the everlasting scorn of rich retirees. It's only about 6 miles, so grit your teeth and pretend you're smiling. 8. The rest area atop Spooner is a good place to get the group back together for the last 20 miles, generally downhill to South Lake Tahoe. The key word is “generally”; you’ll drop back that 1,500 feet over the last 15 miles, but not uniformly, and there will be some relatively short climbs that can totally frustrate you because you’ve already ridden 90 miles and what’s with the uphill? 9. At the finish, you need to check in with the Team in Training tent; they track all riders doing a TnT event, and need to know you’re off the route. You’ll get a TnT finisher’s medal, and they’ll take your picture. There also are commercial photographers; they take your picture climbing up Emerald Bay. You need to remember the time or batch number that they call out when you pass the photographer, so you know which group your photo is in; otherwise, you’re reviewing thousands of photos to find the invariably unattractive one of you grinding up the hill. TnT doesn’t have much in the way of food for free at the finish; there are vendors selling food, but you’ll need to have cash with you. Instead, we may try to organize some drinks and snacks in the parking lot where bikes will be picked up after the ride. 10. Weather can be highly variable, so bring layers. 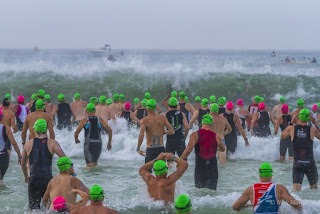 It’s usually cool at the start, but one year it was in the low 40’s and wet, so you needed leg warmers, multiple layers, and winter gloves, and another year we started at 65 degrees in shorts with arm warmers only. The high never usually gets above 80, and the problem usually is on the cold end, like the year it sleeted for the first 2 hours, and the fog was so thick you couldn’t see across the lake even after the sun came out. So be prepared for highly variable conditions that can change dramatically during the course of the day. And wear sunscreen. That’s your day. Starting shortly after 6 am, most people doing the century and visiting almost every rest stop should finish by 3 pm, although the sun is up until 8 pm and there’s no shame in finishing at 5 pm, and if you finish at 2 pm or before the bulk of the group, you may wind up waiting for us because the slower riders will have the necessary car and house keys anyway. Don’t forget to bring rags to clean your bike, especially if it rains. The rental house won’t have them, and while in past years, the Marriott has made old towels available for their riders, that’s not guaranteed and those of you staying other places shouldn’t count on having bike rags available. You also may want to bring an old sheet or bedspread, which could may be useful if we have to transport your bike in a rental car with others to or from the start or finish, or to meet the trailer for pickup or dropoff. It will be hard to do a team photo, though we’d like to have one. Most times you have to do one at the start, but then people are in layers and you can’t see the kits. It usually never works to take a photo at the end, because people are doing different distances and some need to leave as soon as they finish. Whatever we do, some people will be left out, and my apologies in advance. UPDATE 5/19: AMBBR requires that all riders sign in individually, there's no way to register everyone for the ride in advance. However, riders who signed up early enough to have TnT handle your registration will pick up ride ID and sign waivers at a special TnT distribution, which is usually very efficient. Riders who had to register personally have to go to the regular AMBBR registration, at Tahoe Sports in the Raley's shopping center in SLT. The line can be long at Tahoe Sports in the morning, so if you have to sign in yourself, I recommend going in the late morning or early afternoon to avoid the rush. Finally, I’ll be sending around information on bike pickup and dropoff next week, and also will ask if anyone is interested in a short spin on Saturday morning or afternoon. 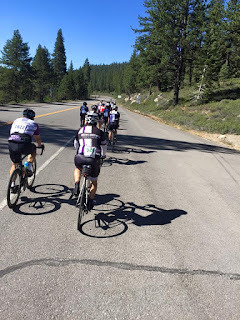 Some riders want to warm up the day before by riding from South Lake Tahoe to the top of Emerald Bay, which is about a 30-35 mile ride and helps you understand what you’ll face on Sunday. However, I’ve never managed to get to Tahoe early enough in the day on Saturday to ride, and it’s never seemed to diminish my enjoyment on Sunday, so a Saturday spin is truly optional; it just depends on whether the timing would work for you and the bike transport Brews crews. UPDATES 5/19: AMBBR riders, especially TnT riders, have been coached to call out road hazards and always call out "on your left" when passing, even when the hazard is "Asphalt!" and there's absolutely no point in calling out passes. Be aware that even schlubby riders will expect you to politely say "On your left" when passing, even if there's no safety issue involved, and you'll often get yelled at for not calling out passes even when it doesn't matter. Just call it out every time you pass a rider with a TnT jersey, or one of those funny/stupid team logos on their helmet. Rest stop strategy: Stop at the top of Emerald Bay, at the park restrooms, and not at the first official rest area about a mile up the road. You also should skip the rest area halfway up Spooner and instead just keep spinning until the rest area at the top. Otherwise, you want to stop at Homewood, Truckee, Kings Beach, and Spooner, if only for the views. You'll also finish with more food than when you started if you do. And if you can, it's good to regroup at Spooner, and then wait for stragglers about a half mile from the end, at the right turn to the back of the finish line parking lot, so everybody on Team Andy (who can) can finish together. Have you seen Andy Gordon's Leukemia & Lymphoma Society (LLS) video yet? If not, here it is; watch it right now, we'll be here when you get back. Now that you've watched, please join Team Andy (motto: Non semper est rectus, sed nunquam in dubium). Here's how. For the last four years, our friend Andy has raised money for LLS by doing a century ride (100 miles) on his bicycle around Lake Tahoe. Andy has become an inveterate cyclist, but more importantly, the mission of LLS is to fight blood cancers. Andy signed on with LLS because his first wife, Sue Gordon, died of multiple myeloma, a form of incurable blood cancer, in 1997. Then, in 2009, Andy himself was also diagnosed with multiple myeloma. After a stem cell transplant in 2010, he went into remission and became a member of Team in Training (TnT), one of LLS’s primary fundraising arms, and serves on the board of the Arizona chapter of LLS. He’s raised over $60,000 to fight cancer – not just his and Sue’s, but all blood cancers – through the Tahoe ride. Andy is also a leading member of our Phoenix-based bicycle group, a coed bunch of generally middle-aged cyclists known as the “Brews Brothers.” He started riding for the exercise as part of his recovery, but he can’t help himself, and has moved into leadership (a pretty loose category with this group). He helps organize the rides, pushing us to ride better and drink better coffee. He was getting ready for his fifth consecutive Lake Tahoe ride, but life intervened. After nearly 5 years in remission, his cancer has returned. He’s in chemotherapy now, and scheduled for a second stem cell transplant in early May. So this year, he can’t fight cancer by riding and fundraising; he has to fight it much more personally. Some of Andy’s fellow riders thought it might be a good thing to take his place at this year’s ride, and to help him keep his streak of being one of the top national fundraisers going, so he can pick up where he left off next year. We threw out the idea to the group, and amazingly enough, over 25 of Andy’s friends have volunteered to raise money for LLS and bicycle around Lake Tahoe not just in his honor, but because we all want to cure Andy’s cancer. We’ll do the riding, but we need your help on the cure. Please join Team Andy for the Gordon Invitational at Lake Tahoe by contributing what you can to help fight blood cancers and find a cure. We’ll finish riding around Lake Tahoe in a day, but we’re hoping for additional years for our friend and colleague. Can we count on you? Click on the donation link, and give generously. Remember, it’s not just in honor of Andy. He’s fighting his cancer, and he’s counting on us. So click on Donate Button for Team Andy, and please contribute. Thanks. 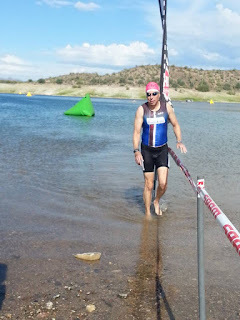 Desert Classic Duathlon at McDowell Mountain Regional Park. 3.51 mile run (photo! 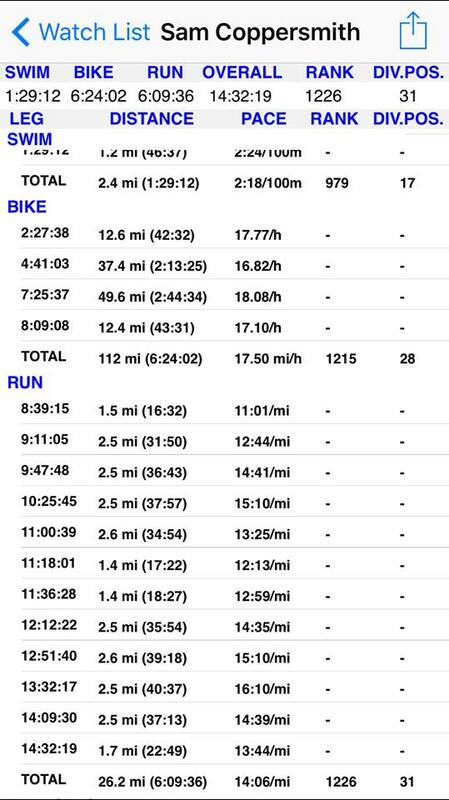 ), 25.17 mile bike (photo! 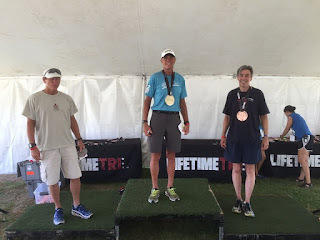 ), 3.51 mile run (same course) in 2:39:34 (finish photo and photo!) Third, and last, finisher in my age group (the other 5 racers registered either didn't show or DNF), so a medal, a picture on a podium, and a second pint glass (plus other podium photos!). It's true, 90% of life is just showing up. Surprisingly tough, so I'm not sure how this Florida thing in November is supposed to work for me.